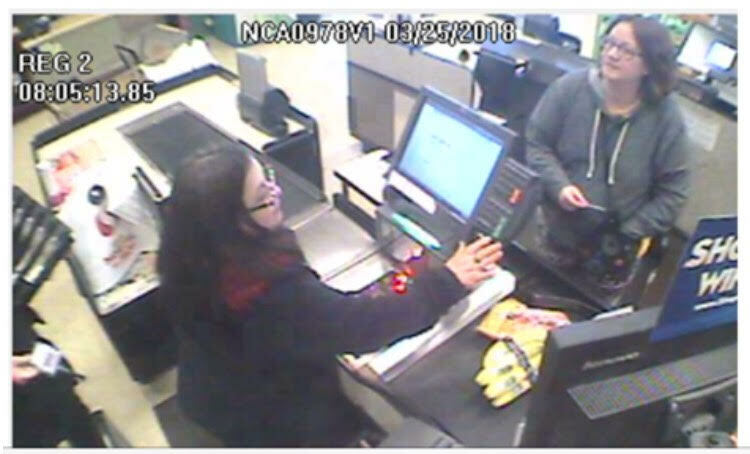 Jennifer Hart from a video taken at the Fort Bragg Safeway on the night of March 24, provided by the CHP. WILLITS, 4/3/19 -- The inquest into the deaths of the Hart family began today, with testimony from various law enforcement agencies from several states detailing the tragic circumstances that eventually led to a Jennifer Hart driving the family vehicle off a cliff killing herself with her wife, Sarah, and their adopted children just over a year ago. The purpose of the inquest is to determine whether the cause of death was accidental or not. Six people testified, though much of the information that came out had already been made public over the course of the last year. Some new details did emerged concerning difficulties with the recovery operation and the autopsies, as well as additional specifics from the toxicology reports. Today, people testifying included several California Highway Patrol officers, a Mendocino County Sheriff’s deputy, and search and rescue coordinator, a deputy from Clark County, WA, where the Harts were living before their deaths, and the forensic pathologist who performed autopsies on six of the eight people in the case. Proceedings began this morning at 9 a.m. at the Willits Police Department, and were live-streamed for the public due to the widespread attention about the case. An inquest is a fairly unusual procedure in Mendocino County. The inquest consists of public testimony from law enforcement officers and investigators, before a special 14 person jury who are tasked with determining the cause of death. Under California law the fourteen jurors will decide from four options as to the cause of death: natural, accidental, suicide, or at the hands of another other than by accident. In this case, investigators suspect that Jennifer Hart, and possibly Sarah Hart, deliberately drove off the cliff late last March. However, if the deaths are determined to be deliberate, the suspects are not alive to prosecute — hence the inquest. The inquest went quite fairly quickly and so is proceeding ahead of schedule, with less than full day of testimony scheduled for tomorrow. We will be publishing a more detailed article after the testimony concludes. The Hart family were last living in southern Washington State, and were last seen there on March 23, 2018. 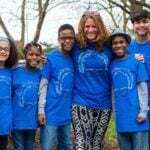 On March 26 their gold Yukon was found at the bottom of a cliff off State Route 1, in Mendocino Co. Jennifer, the driver, Sarah Hart, her wife, both 38, and three of their adopted children, Marcus, 19, Abigail, 16, and Jeremiah, 14, were found dead at the scene that day. The remains of two more children, Ciera, 12, and Hannah, 14, were discovered over subsequent weeks. Another adopted Hart, Devonte, remains missing but is presumed dead. The investigation, which drew national attention, spanned several states and uncovered multiple reports of child abuse. Witnesses today included two California Highway Patrol officers, the officers to arrive on the scene, the Mendocino County deputy who performed coroner’s duties on the scene of the collision, the Mendocino County Search & Rescue coordinator who led the searches for bodies and evidence, and the forensic pathologist contracted by the MCSO who conducted the autopsy of six of the family members. Hannah Hart was only identified in January, 2019 when a genetic match was made with a human foot that washed ashore in May, 2018. The remains of Devonte have not yet been found. Officer Michael Covington of the CHP, noted that there was no evidence of any skid marks at the scene, which he called “very unusual.” Since the vehicle crashed at the bottom of the cliff and difficult to access, the initial recovery of the bodies was hampered, and a CHP helicopter was called to the scene to assist. During the recovery of the vehicle, Jennifer Hart’s body fell out of the SUV, which possibly resulted in additional injuries that could not be distinguished from those that occurred during the crash. At the same time, a bag fell out of the vehicle, which was found to contain IDs and flash drives. Another difficulty that arose during the investigation was the rough seas at the time, and the lack of easy access points to the shore. Jared Chaney of the Mendocino County Search and Rescue testified explained that there was basically, “a whole new beach” every tide cycle, complicating the search for additional bodies or evidence. In the days that followed the crash the Coast Guard provided customized ocean current predictions, and volunteers made a wide search around the crash site, stretching from over a mile north of the crash to Noyo Harbor in the south, as well as a search in the Point Arena area, yet though they found related debris from the crash, they did not find any more bodies. Weeks later Ciera Hart’s body was recovered. In a grisly detail, he noted that Hannah Hart’s foot was discovered by a “civilian canine,” on a beach that had been searched several times. The forensic pathologist, Dr. Greg Pizarro, who conducted the autopsies on six of the Harts related that Jennifer Hart was the only one who appeared to be wearing a seatbelt at the time of the crash. Jennifer was found with a blood alcohol level of .102, well over the legal limit. Sarah Hart, along with the three children found at the crash, all had levels of diphenhydramine, the active substance found in Benadryl, at either “toxic” levels or at significantly higher levels than would be therapeutically recommended. Benadryl can cause severe drowsiness. However, he testified that the primary cause of death for all five was due to impacts resulting from the collision, particularly to the neck and head. Due to the condition of Ciera and Hannah’s remains, little could be determined about their state at the time of their death. Ciera was found to have broken both arms and both legs, but it was difficult to assess whether these injuries occurred before or after her death. Deputy Adam Beck, a detective with the major crimes unit of the Clark County Sheriff’s Office, related how he had begun an investigation into the circumstances around the Hart’s disappearance the day after the vehicle was found. At that time, Beck said, investigators still hoped to potentially locate some of the missing children, but found no one at the residence. He noted that there were no indications that the family had planned a trip, and no unusual activity on their credit cards or bank records, although a purchase had been tracked via a Safeway rewards card to Fort Bragg. A fresh carton of milk left in the refrigerator, toothbrushes, and luggage had been left behind, along with a number of animals. There were also some pieces of a wall knocked over that may have been caused by a vehicle backing up in haste. Thursday’s testimony will include investigators from the CHP and the Mendocino County’s Sheriff’s Office who will provide further information about the investigation. You can watch the full video of the proceedings here.